"The French went to contact the British to stop them working and they clashed with each other," said Dimitri Rogoff, who heads the Normandy fishing committee. The British were unable to match the local flotilla for numbers and were ultimately chased away. Two British boats, Golden Promise and Joanna C, returned to Brixham harbour with damaged windows. The crews alleged they had been were surrounded and had rocks and metal shackles thrown at them. A video on French media showed a Scottish scallop dredger, the Honeybourne 3, colliding with French vessels. A French local government spokesperson, Ingrid Parrot, said: "Things were thrown on both sides - from the English and from the French. Both parties were extremely tense." Image caption British boats are legally entitled to fish off the Normandy coast - but their French counterparts accuse them of "pillaging"
Why has it all blown up now? Tension has rumbled for 15 years, but in the past five years a deal has prevailed - larger British boats stayed out of the area in exchange for more fishing rights. British boats can gather scallops year-round, but French law restricts the scallop fishing season to between 1 October and 15 May. "For the Brits, it's an open bar - they fish when they want, where they want, and as much as they want," Mr Rogoff complained. "We don't want to stop them from fishing, but they could at least wait until 1 October so that we can share. "Scallops are a flagship product for Normandy, a primary resource and a highly sensitive issue." How have the British reacted? Mike Park, chief executive of the Scottish White Fish Producers Association, described the clashing incident as "clear piracy". Speaking about the Scottish boat, he told BBC Scotland: "He's fully entitled to be there. UK vessels can enter that French zone, it's not illegal. "The Peterhead vessel is going about its business. The French vessels are probably attacking it." 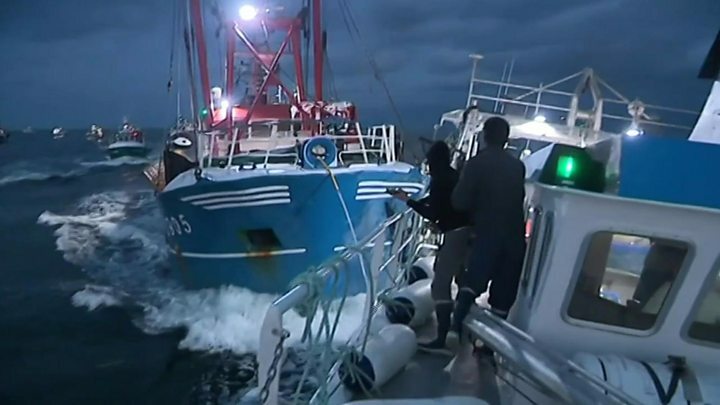 Appeals for calm were issued by Britain's National Federation of Fishermen's Organisations, which said some boats had been filmed manoeuvring dangerously. "We have raised the matter with the British government and asked for protection for our vessels, which are fishing legitimately," its chief executive, Barrie Deas, said.